Here are some suggestions for both road and off road routes with a little detail to help and advise your decision making on what might be best for you. The road routes are basic descriptions for use with a map or road atlas, including mileage, grade, timings, etc. The mountain bike routes are downloadable maps / descriptions to print out and follow in conjunction with a good OS map. These range from easy graded routes to very technical singletrack and wilderness mountain trails. 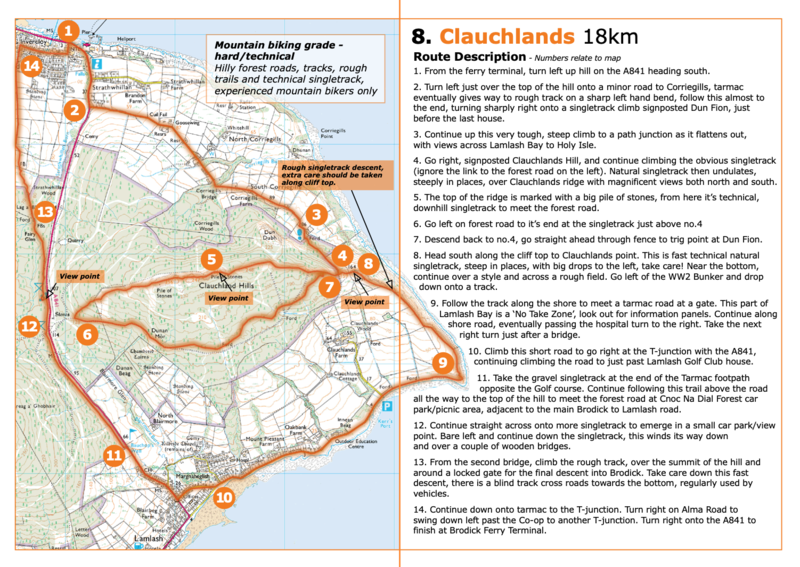 Clauchlands Route Start and finish in Brodick, grade - hard/technical 18km. Hilly forest roads, tracks, rough trails and technical singletrack, experienced mountain bikers only. 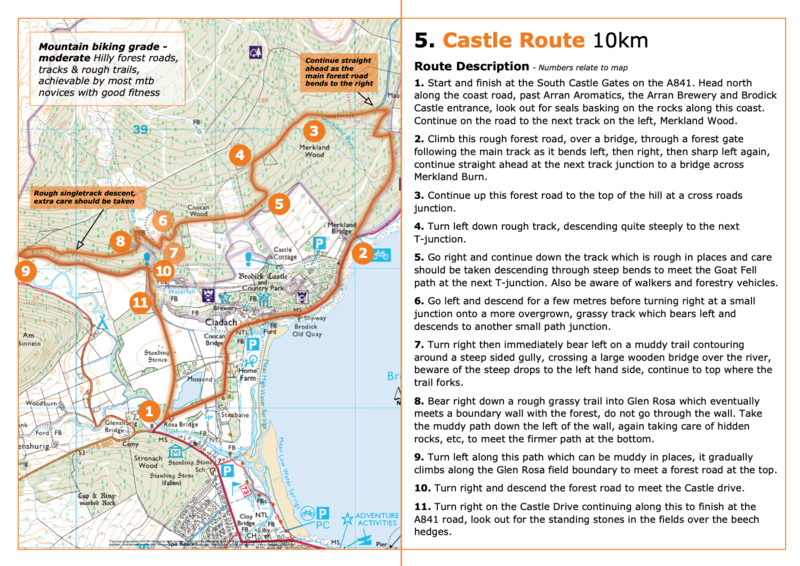 Castle Route Start and finish in Brodick, grade - easy/moderate 10km. Hilly forest roads, tracks, rough trails, achievable by most MTB novices with good fitness. 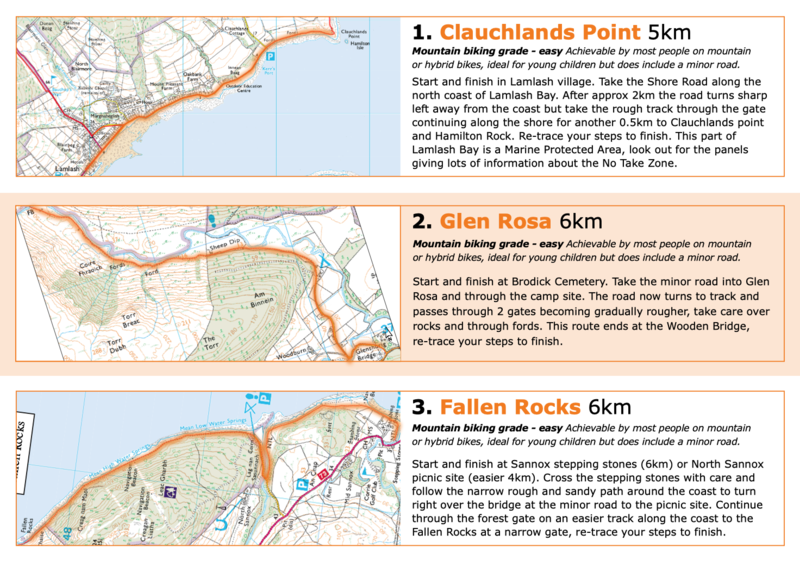 Glencloy Route Start and finish in Brodick, grade - easy/moderate 10km. Hilly forest roads, tracks, rough trails, achievable by most MTB novices with good fitness. Laggan Route Start and finish in Sannox, grade - hard/technical 25km. Hilly forest roads, tracks, rough trails and technical singletrack, experienced mountain bikers only. 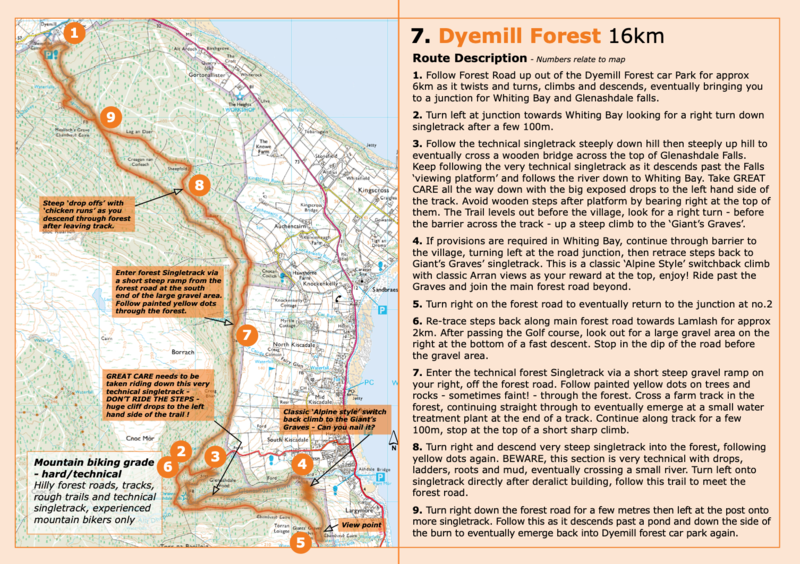 Dyemill Forest Start and finish in Dyemill Forest Car Park, Lamlash, grade - technical/severe 16km. Hilly forest roads, tracks, rough trails and technical singletrack, for experienced technical mountain bikers with good fitness. 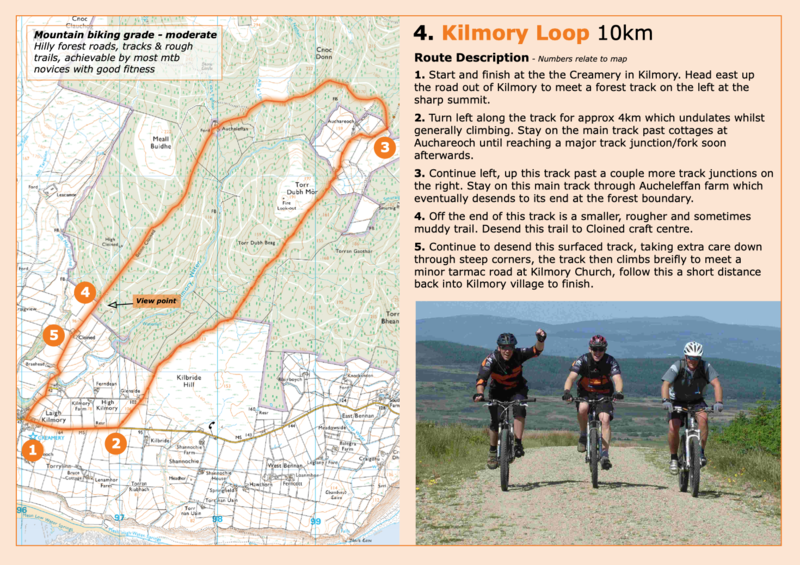 Kilmory Loop Start and finish in Kilmory, grade - easy/moderate 10km. Hilly forest roads, tracks, rough trails, achievable by most MTB novices with good fitness. Arran End to Enduro Start in Lochranza and finish in Kildonan, grade - hard/technical 50km. Hilly forest roads, tracks, rough trails and technical singletrack, for experienced technical mountain bikers with very good fitness. Short Family Trails 3 separate 6km trails on Arran's East coast, grade - easy/moderate. Quiet lanes, forest roads, tracks and trails, achievable by most MTB novices, families and younger children. Lochranza Loops Start and finish in Lochranza, grade - easy/moderate 10km. Hilly forest roads, tracks, rough trails, achievable by most MTB novices with good fitness. Do both loops anti-clockwise for best riding. From Brodick head North to Lochranza then south down the West coast to Machrie, take the Machrie Moor road to meet the middle 'String' road and East back to Brodick. Approx 40 miles, includes 2 big climbs, 2 - 4 hours depending on fitness. From Blackwaterfoot follow the middle 'String' road East through Shiskine to meet and take the Machrie Moor road North West to Machrie. Head South back to Blackwaterfoot. Approx 13 miles, flat and undulating, 1 - 2 hours for most people. From Brodick take the middle 'String' road West through Shiskine and South through Sliddery to meet the Ross road North East to Lamlash. Head North back to Brodick. Approx 30 miles, includes 2 big climbs, 2 - 4 hours depending on fitness. 4. Ross & South End A shorter but still challenging loop! From Lamlash climb the Ross road South West to meet the Coast road East through Whiting Bay and back to Lamlash. Approx 23 miles, includes 1 big climb and a few smaller ones, 1 - 3 hours depending on fitness. From Lamlash head North East along Shore road to a gate at the end, take the track through the gate to Clauchland's Point, and return. Approx 5 miles, flat single track coast road, half to 1 hour, perfect for young families. From Brodick take the middle 'String' road West through Shiskine and South through Sliddery, Whiting Bay, Lamlash and back to Brodick. Approx 35 miles, 1 big climb and quite a few smaller ones, 2 - 4 hours depending on fitness. 7. Arran Circular The Island's complete coast road. From Brodick head North to Lochranza then south down the West coast to Blackwaterfoot, through Sliddery, Whiting Bay, Lamlash and back to Brodick. Approx 57 miles, 2 big climbs and quite a few smaller ones, a challenging 3 - 6 hours depending on fitness and stops. 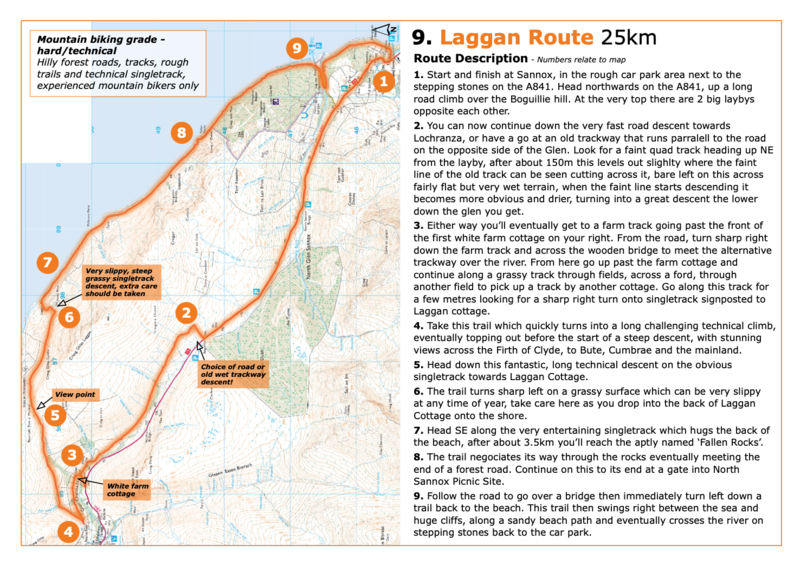 For anyone with a little fitness and a sense of adventure Arran’s coast road has always been a great, challenging day’s ride. There are more and more charities and event organisers using the 57 mile loop, tempting all levels of cyclists around one of Scotland’s most beautiful and accessible islands and rightly so, you’d be hard pushed to ride a more perfect loop, just the right balance of flat and hills, an abundance of cake stops and scenery that really is second to none. It hugs the coast most of the way around so there’s always sea scapes to one side and mountain scapes to the other. On a good day there are views over the islands of Bute and Cumbrae all the way into the highlands north across the Firth of Clyde, to the south west is Ireland beyond the tip of the Mull of Kintyre, and around the south and east views past Ailsa Craig to the Ayrshire coast, Troon and beyond into the Galloway hills. Unfortunately for most, Arran’s coast road is over far too quickly, consisting of a morning ferry from Ardrossan on the Ayrshire coast, a lap of the island and an afternoon ferry home. The island has 2 other less cycled roads across it’s interior and although they are only each about 10 miles long connecting east and west coasts, they do contain Arran’s 2 highest road summits and with a little creative route planning open up a whole host of different cycling opportunities, which is where this Alpine Stage is born. Most cyclists considering Arran as a road cycling destination would probably look upon it as fairly limited in route choice, but the island has a very active cycling community, with road cycling and mountain biking sections and also a Belles on Bikes group for ladies. They all ride once or twice a week and so have become very creative in getting as much out of the island as possible. The Arran Alpine Stage is at the more challenging end of this creativity! It uses the islands 3 big mountain passes, one of them from both sides plus a another smaller hill to create a 70 mile route with 3500ft of climbing in these 5 climbs alone, never mind all the other undulations bringing the grand total to well over 4000ft. As with all good Alpine Stages the 4 major climbs can be categorized into 1, 2 & 3, the hardest cat1 climb coming after 2 cat2’s and the smaller hill climb leaving the final cat3 to finish over. The route starts and finishes in Brodick at the Ferry Terminal, so still doable in a day from the mainland for stronger cyclists, but for most as part of a multi day visit where some local R&R are all part of the perfect Arran experience. The route begins from Brodick with only 1 mile to get your legs turning before hitting the day’s first cat2 climb up the ‘String’ road (B880) towards Shiskine, nearly 800ft straight up from sea level, don’t forget to look back a few times as the views open up the higher you get, although you will get chance to see it again towards the end of the day as this becomes the final descent to finish back in Brodick. A beautiful sweeping descent now takes you into the Shiskine valley for a few miles before turning right across Machrie Moor on a lovely single track tarmac road to pop you out on the island’s west coast at Machrie Golf club. Turn right and head north, hugging the coast through Pirnmill and Catacol to Lochranza, Arran’s most northerly village with a spectacular ruined castle in it’s bay. Swinging back southwards you now leave Lochranza past the distillery, home of the Arran Malt Whisky, well worth a visit and refreshments before tackling the 2nd cat2 climb of the ‘Boguillie’ another 660ft from sea level and at it’s summit one of the island’s best views of it’s rugged high northern mountains, fondly known as the ‘Sleeping Warrior’. This descent now drops you back onto the east coast at Sannox where the road again hugs the coast through Corrie village and back towards Brodick. Over half way now but make sure you’ve saved plenty of energy for the second half! Back through Brodick and past the Ferry terminal you now head up the 380ft hill between Brodick and Lamlash, both these villages have an abundance of refreshment stops. Descending steeply into Lamlash village you’ll have stunning views across the bay to Holy Isle. Leaving the village at it’s south end brings you to a right turn onto the ‘Ross’ road, not much short of 1000ft straight up makes this the cat1 climb of the day, single track all the way and again magnificent views from the cattle grid at the top. A exciting but narrow technical descent with Alpine style switch back corners now takes you through Monamore Glen to eventually meet the main coast road once again at Sliddery. Turn right on this now very undulating road through Sliddery village itself and onto Blackwaterfoot where final refreshments can be had before tackling the Shiskine valley again. This time west to east which climbs more gradually hence the cat3 status, eventually summiting at the top of the ‘String’ road once again for final views over Brodick castle across the Firth of Clyde to the mainland. A very fast descent drops you back into Brodick to finish back at the Ferry Terminal. All in all a very challenging, sometimes punishing but always rewarding cycling route, this Arran Alpine Stage has all the style of any classic mountain stage with the added bonus of being continually surrounded by sparkling seas.